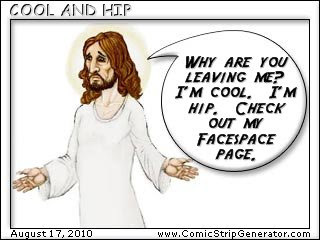 Inspired by The Perils of 'Wannabe Cool' Christians. A great many of the younger generation in the Catholic Church are very pleased to see the Bride of Christ move away from the trendiness of the 70s, and return to the trendiness of the 16th century. "Tendiness of the 16th century" That is a phrase I expected to hear. Though, I like to think that permanent things, like God and Marriage, aren't trendy.